The legend wants Amalfi to have been founded by Hercules in name of his beloved nymph, Amalphi. Hercules wanted to bury her in the most enchanting place on earth in which, to testimony of his great love, he founded a city with her name. An historical hypothesis, sustains instead, that Amalfi draws its origins from Roman families on their way to Constantinople, crushed in a storm in the gulf of Policastro; they would have so founded one "Melphes", the actual Melfi then transferred more to north, took abode in the actual Amalfi, calling it with the name "Á.-Melphes". As matter of fact on the city symbol there is the wrinting: descendant from roman nobles. The first definite news about Amalfi goes back to 533, at the time of the Gothic war when, with the victory of Narsete over Teia, Amalfi passed under the dominion of the Byzantine empire belonging to the dukedom of Naples. Submitted to the Byzantines, it became a commercial trade center between the east and southern Italy. Amalfi was constituted, around the 850, in an autonomous Republic held up by two judges subsequently called dukes. 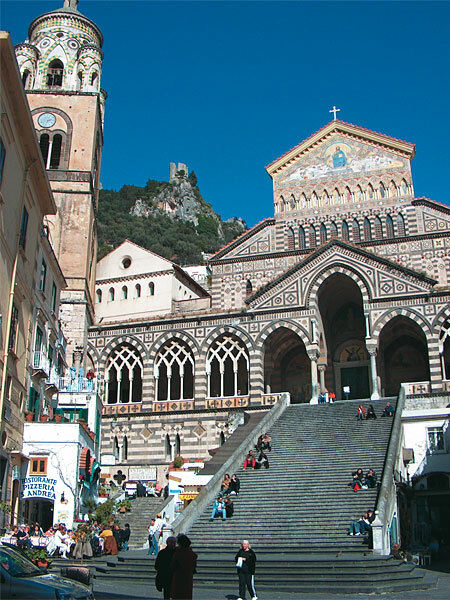 The city of Amalfi, kept for commercial reasons, good relationships with all the powerful entities in Italy and also with the Muslim world; the latter relationships broke whwn Amalfi took sides with the popes providing ships and funds for the first crusades. In the X century it became the most powerful seafaring republic and with its ships navigating all the seas, from the Mediterranean in the extreme East, developing a flourishing commerce that produced huge wealth for its inhabitants; it also developed the art and culture, created some commercial rules, the Code of the International Maritime Right was edited, Amalfi navigators improved the compass (the Amalfitan Flavio Gioa takes credit for inventing it). The Tabula Amalphitana is a precious document dating back to the end of the eleventh or the beginning of the twelfth century, that contains the laws and the seafaring customs of the glorious maritime republic of Amalfi. These regulations, recognised as valid and adopted by various maritime powers, for many centuries made up the universal trading code for the entire Mediterranean. Composed of 66 articles, 21 in Latin, the important document is today housed in a fifteenth-century version, in the Amalfi Civic Museum housed in the Morelli palace, currently the municipal headquarters of the famous township. In 1048 the amalfitans founded the hospital of S. John in Jerusalem from which it drew then the name the order of the Ospitalier Knight, nowdays Knights of Malta. The city reached the maximum splendour in the first half of the XI century but, in 1073, subdued by the Normans, it began its decadence: it came to conflict with Venice and Bisanzio, among them allied, and lost a lot of the influences and privileges that it hadin the East. In 1131 it became part of the Kingdom of Sicily and a few years later it was attached and ransacked twice by Pisa (1135 and 1137). It had a brief revival in the XIII century under Frederick the II. In 1343 a dreadful seaquake, described by Petrarca, invested the coastline; most part of the inhabited area was destroyed (with it probably also the Ducal Palace, quoted in a document as "palatium amalphitanum"), the fortifications, the shipyards, the stores and the maritime equipments were submerged. Five years later, the 1348 famous plague, described by Boccaccio, completed the work of destruction among the population. Amalfi and all the towns of the coast which had been splendid strengthen populated cities, rich of sumptuous buildings, adorned of frescos, marbles, columns, fountains, set out to become modest countries that, deprived of the wealth that came from the sea, returned to the traditional economy of fishing, of local craftsmanship and agriculture. 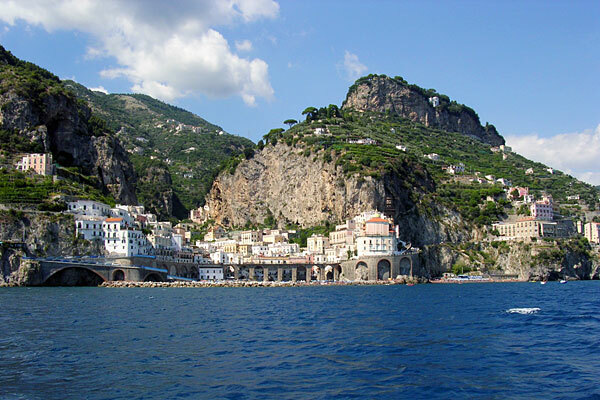 Amalfi practically goes out of the scene of the great seafaring cities and slowly started it way to become one of the most famous tourist places in the world.